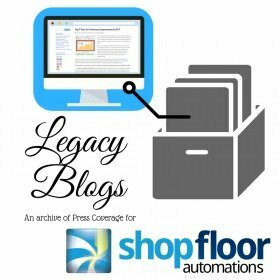 We are always appreciative any time we get press coverage, here at Shop Floor Automations. This is especially a great edition for Spanish speaking readers, where we feature our Modern Machine Shop Mexico coverage. Manufacturing Tomorrow published our piece talking about organizations who are enriching the Made in America movement, which you can read here. Manufacturing Talk Radio also published the same piece here, which includes coverage on Workshops for Warriors, Open Source Maker Labs, and Edge Factor. We thank Aerospace Manufacturing & Design for talking about our Wi-Fi USB Connect product here. MFR Tech also published our piece talking about how spreadsheets kill productivity at a manufacturing operation and why graphical job scheduling is the best alternative to this old technology. Finally, Modern Machine Shop Mexico has published a few of our pieces. They also have a cool homepage for us with Spanish-speaking resources.